In this final installment of four, he analyzes the popularity and success of a traditional absentee ballot chase. He also analyzes the strengths of a balanced yard sign program. He closes the series with plans on how to expand on these accomplishments for Polk County’s future. A ballot chase was another old idea that I was wrong about. Since time immemorial, the Polk County Democrats had organized an absentee ballot chase on Election Day. Many people, including me, thought it was a waste of time. We’ve always helped people complete the absentee ballot requests to vote by mail, but we usually rely on them to finish the process after they make the request. This year, though, when we reviewed the voting records we requested from the County Auditor (which cost just $10), we learned that more than 5,000 ballots requested by Democrats had not been returned to be counted. We got to work planning not one but three days of calls and visits to people with outstanding absentee ballots. We half-jokingly declared it the “Great Polk County Ballot Chase” to poke fun at our own sense of seriousness, and we put the call out for volunteers on social media. We were surprised when dozens of people showed up to our Polk County headquarters for the first day of the chase on the Sunday before the election. For those who haven’t seen a ballot chase, it’s quite simple: a bunch of people use the list of absentee ballot requests to call those who haven’t returned their ballots and ask if we can come and pick them up. A few volunteer dispatchers let volunteer drivers know where and when to pick up the ballots in the field. If the polls are open, they can also just take the voters to cast their ballots in person – at the County Auditor’s office the day before, or their polling place on Election Day. That close to the deadline, we strongly caution voters about mailing their ballots in so that they don’t need to worry about postmark deadlines and possibly not being counted. We collected and delivered every ballot we could. We called the entire list twice. We answered questions. We translated conversations into several languages. We helped an active service member vote from overseas. We expanded our hours every day. Instead of using the two rooms that we planned for, we ended up using seven rooms. People were coming and going all the time. We were giving constant updates on how many absentee ballots we still needed to pick up on social media, which made even more people come in to volunteer. People were bringing their children—we had a dozen kids running through the halls at one point. People’s shared photos from the Polk County command center were getting lots of attention on social media. An endless stream of pizzas, snacks, cookies, and energy drinks were being delivered. Former Lieutenant Governor Sally Pederson even showed up to make calls. It was the most fun I’ve ever had during a campaign. After the polls closed, we went to bed feeling good about what we thought was a 35,009-vote advantage in Polk County. To our surprise, the final count rocketed up to 37,784 after the absentee ballots were tallied. The Great Ballot Chase helped us post the highest Democratic margin out of Polk County in Iowa’s history. The ballot chase will be more than an afterthought before the next election. For the first time, we’re keeping the Polk County Democratic Party headquarters open permanently instead of just finding a new one every two years. Many of the new volunteers who helped chase ballots have joined the Polk County Central Committee. This kind of activism will be part of our culture as a county party going forward. 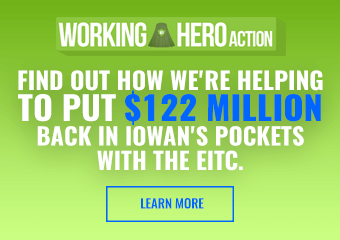 There are two unquestionable ideas in Iowa Democratic politics. The first is that Iowa can never lose the first in the nation caucuses. The other is that “yard signs don’t vote” and thus shouldn’t be prioritized. I know staffers who have been told that they can’t be taken seriously if they argue otherwise. I know candidates who have been told that they won’t be considered viable if their campaign is going to place an emphasis on yard signs. This is as close to an inviolable truth as it gets in modern politics in Iowa. Many volunteers quietly admit that yard signs “vote” as much as mail pieces or television ads do. One longtime activist told me he understands that yard signs don’t vote, but he’s always noticed that the candidate with the most yard signs has won every election he’d seen in more than 40 years. Studies about yard sign effectiveness have mixed conclusions. The studies most critical of yard signs, though, are the ones most often shared by campaign staff. Yard sign requests are often tinged with frustration. Campaign staff want to use volunteer time elsewhere and save money for ads and persuasive mail. Sign requesters have usually made several requests for signs and insist that they should have had their yard signs last week. Meanwhile, staff can find themselves thinking that in the time it took this supporter to drive to headquarters, pick up a sign, drive home, assemble and install it, they could have made twenty calls. 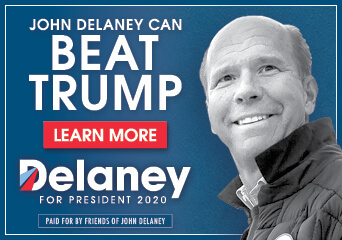 That being said, Democratic campaigns have been almost completely ruling out a campaign tactic that has been used since Rome because of a few studies and because they can be annoying to staff. There is a middle ground, and several ways to make the process less frustrating for all involved. Representative John Forbes, who represents Johnston and Urbandale in Polk County, has an exceptionally strong yard sign program. He and his volunteers keep a list of houses who will let him display a sign in their yard every election. Instead of constantly chasing daily yard sign requests, they do a massive yard sign drop one weekend in the fall. This helps conserve time and resources, it provides a nice unifying volunteer event, and it makes a big impression when a few hundred John Forbes signs all appear at the same time. It’s possible campaigns can get by without yard signs in Polk County, but they’re important for Democrats outside of the major metropolitan areas. Rural highways and small-town streets seem full of Republican signs with few, if any, from their Democratic opponents. Democratic county parties beg statewide and national campaigns for them. When they do get them, it can be just a handful for the entire county. People even try to buy them from national campaigns, but they can take months to show up. Dr. Robert Leonard has become a good friend of mine and he’s spent a significant amount of time talking to his neighbors in rural Iowa. When they don’t see any Democratic signs, they think we don’t have a presence there. Even worse, they think that we don’t care. There are football coaches and former mayors and doctors and even religious leaders who have offered to put Democratic signs in their yard without any luck. It is heartbreaking that we’ll gladly pay for a sixth or seventh mail piece but won’t give a second thought to a yard sign. Why do people want yard signs? For the same reason that they want buttons and bumper stickers – to show their support. The message is deeply personal for supporters: even though I’m not supposed to talk about religion or politics with you, my fellow neighbor, I trust and support this candidate so much that I want you to know about it. This isn’t just morale boosting, although that’s a benefit, too. Visible support shows not just viability but credibility. While we can all agree yard signs don’t vote, we can probably also admit that the opinion of someone we trust and respect can prompt us to take another look at a candidate or issue. This can be especially useful in areas where Democrats seem outnumbered: a few signs can help people see that their candidate stands a chance, and that their supporters are the same decent, hardworking people they’ve always known as neighbors. Do yard signs get a bad rap because they seem to annoy campaign staff? Do people ignore them because no one other than a print shop makes money off of them? It’s useful to consider where campaigns spend money now. Consulting firms can charge a fee for each mailer sent, each social media ad promoted, and each commercial aired on television. They don’t make any money on yard signs. 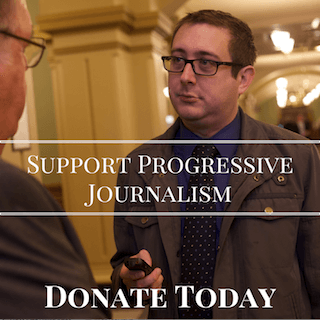 Neglecting yard signs may not even be a conscious decision, but I don’t see the sense in spending stacks of money on mailers, TV commercials, and now digital ads while ruling out these grassroots advertisements altogether. People like John Forbes show that you can use yard signs strategically without letting the requests for them overwhelm your campaign operations. Big signs are nice, too. In Polk County, we answered the requests for more advertising with the maximum response on Election Day 2018. We bought out 19 digital billboards across Polk County. White lettering on neon blue proclaimed, “SAVE AMERICA – VOTE TODAY.” It included our web address. The homepage of our website featured a lookup tool for Polk County polling sites and the phone number for our voter hotline. Our “voter hotline” was actually my cell phone number, so I can tell you that the billboards worked much better than expected. It’s hard to think of spending an entire year working toward another year, but much of 2019 will be spent organizing and planning to make sure that 2020 is a success in Polk County. A bad caucus, county convention, or election could undo everything that we have worked so hard for over the past two years. We have almost 200 caucus sites to book, hundreds of leaders to train, and countless details to iron out before the 2020 Polk County Convention. 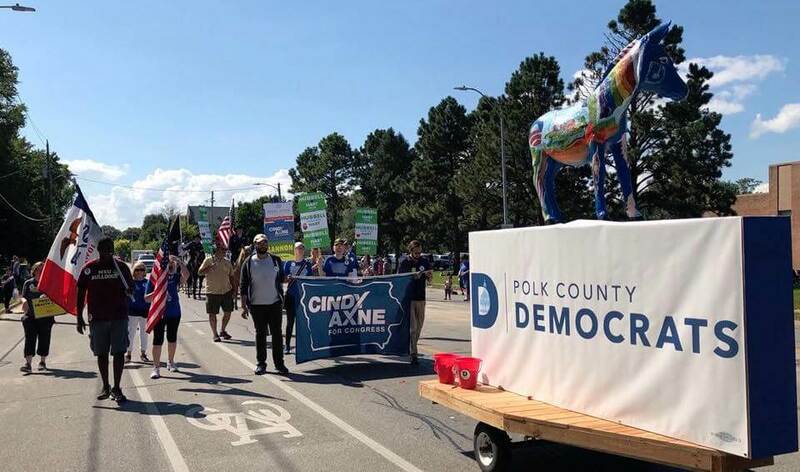 The convention leaders of the Clinton and Sanders camps in 2016 had a lot of gripes, but we’re now the leaders of the Polk County Democratic Party. So, it’s up to us to make sure we have a successful caucus and convention process for everyone this time around. We’ll also be looking to give back to our community. It’s one thing to ask for the votes of folks around an election every two years. It’s time for us as Democrats to start volunteering at non-party activities to show we really care about the community around us. Our first community giveback will be stocking books at the Planned Parenthood book sale this spring. That kind of work is just as good for those we’ll help as it will be for us. We’ll be hosting dialogue about how to talk to refugee and immigrant voters in Iowa. Our state has a proud history of welcoming new citizens and we as a party can do so much better to welcome them as voters too. Instead of getting annoyed that a new voter doesn’t want to register to vote, we need to ask why they might not want to. Is the government in their previous country known for being open and transparent? Can being part of the wrong political party be harmful to your family in other countries? In some places, being in the wrong party can get you killed. Is the government in our own country doing enough to welcome them? Are we doing enough to educate people about the voting process? It broke my heart when I talked to a new voter who thought she had to pay to vote here. We’ll also be getting far more active in city and school board races. Though technically nonpartisan, those races are the best places to start building our Democratic bench. There are far more Democrats than offices in Polk County and too many good Democrats have given up on politics because there wasn’t an office for them to run for. Although we won’t formally endorse candidates in nonpartisan races and certainly will never endorse before a competitive primary, we can get the word out on which offices are open, nudge future leaders, and make sure voters know who the registered Democrats are in every race. More importantly, we can train them on how to be effective candidates for office and connect them with the volunteers to help them be successful. The old idea that there were some offices that the Polk County Democrats wouldn’t run candidates for is over. We will contest every race. We’ve had a few requests to share what has worked here with other counties and we’re more than happy to do so. We try to proceed with caution and humility with our fellow county parties, though. If there’s one thing that always sells in Iowa, it’s beating up on Des Moines. If there’s one thing that always sells in Iowa Democratic politics, it’s trash-talking Polk County. I get that. We get the most attention, so we’ll take our lumps. We are wary, though, of the appearance that we’re telling other counties or candidates what to do. Folks in other counties know their counties best. Folks in an area with more rural voters often know their communities better than we do. If we can be of assistance, though, we’re willing to share what has worked for us. We’re working on presentations with the Ankeny and Johnston organizers who helped propel Heather Matson and Karin Derry to their respective victories. Those will be shared around Polk County and we have several requests for them to talk to our legislators and organizers across Iowa. We’re happy to put a few more miles on our cars if need be. Along with all of that, we’ll continue recruiting more women to run for office and building Community Groups and empowering younger Democrats and welcoming new volunteers and finding better ways to communicate and introducing national leaders and carrying around a fiberglass donkey and marching in parades and registering voters and chasing ballots and creating a community that we can be proud of. I have no idea why we stopped doing any of this. I have no idea why we haven’t been doing this all along. Thank you to Ashly Banta, Peter Crane, Ryan Crane, Bret Dublinske, Rebecca Dublinske, Suzette Jensen, Lindsay Paulson, and Jeremy Rosen for reviewing this piece in its original form. Thank you to Francis Boggus for the nudge to put these ideas on paper while they were still fresh. A special thank you to Chelsea Lepley, who spent weeks editing these articles and, as the late great Lyndon Johnson once said, helped turn chicken s*** into chicken salad.